Not eating as well as before – make sure they aren’t being fed by another source like a second family member or neighbour by keeping them inside for a few days to see if a normal feeding pattern resumes. If not, and there hasn’t been a change in the household, then a visit to the vet is the next step to take. Urinating outside the litter tray – your cat is trying to tell you something so don’t get upset. Anything out of the ordinary can stress your cat. Your kitty could have an underlying health problem that is causing him or her to be incontinent, so a visit to the vet can rule out illness. But otherwise, think about your cats environment. Have you changed around the furniture, or has there been a death in the family? 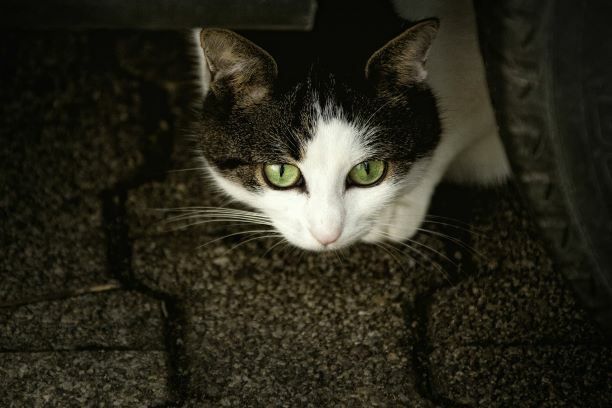 Cats are very perceptive, and these types of changes can cause stress. Constipation, diarrhoea or other digestive problem – Consult your vet to make sure there is no underlying health problem. Your vet can give you sound advice on dealing with a stressed cat, as well as health tips and treatment. Excessive grooming/scratching – If your cat is licking a spot until it is bald or red-raw then you can be assured he or she is suffering from stress or a health condition. Fastidious grooming doesn’t mean stress, but if the licking is extreme and leads to rawness or hair being pulled out there is a problem. Visit your vet. Isolating – when cats isolate themselves it is a clear signal that something is not right and that they’re either stressed or in pain. Take your cat to the vet and discuss the possible causes of the strange behaviour and you will probably find a solution and have a happier kitty. Vocalising excessively – take notice if your cat begins to meow and mumble more often than usual because this is how cats communicate with humans, and only with humans, not other cats or animals. So, if your cat is talking to you, especially with a different tone in their voice, something is wrong and he or she is trying to tell you. Aggression – If your cat is showing signs of aggression towards the other cats or animals in the household or to humans, it could be a sign that either your cat is stressed or has some kind of illness. Consult the vet for a check-up and discuss the behaviour and come to a solution and help your cat to live a happier life. Play and Exercise – it’s a great stress reliever for you and your cat. Get out the toys, a ball of wool or tie a feather to a piece of string and draw it slowly across the floor for puss to chase. Cats love cardboard boxes, so leave a few of them around and watch puss climb in and sit there! Create a Safe Zone – make your cat a safe zone, a secret hiding place in your home where he or she can escape from a stressful event like a storm, a party, or even a handyman visit to fix something. Quality Food – make sure the cat food you buy for your kitty is high-quality. This will give puss a healthy diet which can only add to a sense of wellbeing. Be Patient – if you are expecting a new addition to the household, be that a new baby, a spouse, flatmate or another cat or animal, you need to be patient and understand how this might affect your cat. Don’t try rushing the relationship but let the cat come around at their own pace. Watch Body Language – if you need to take your cat to the vet be aware that it can be a terrifying experience – if puss’ pupils enlarge you can be sure someone is not happy. A good idea is to buy some Feliway spray and douse a blanket and the cat carrier with it. Feliway is a man-made pheromone similar to the one cats emit from their cheeks when they mark their territory on legs or furniture. Being in or near their territory brings about a sense of calm in the cat. Also, lay a light rug over the cat carrier to help the kitty to stay calm. For more animal behavioural advice, visit Pet Problems Solved.